I have Roxio VHS to DVD 3 Plus (Build 301B91B ENU). My source is a Hi8mm Digital Tape. 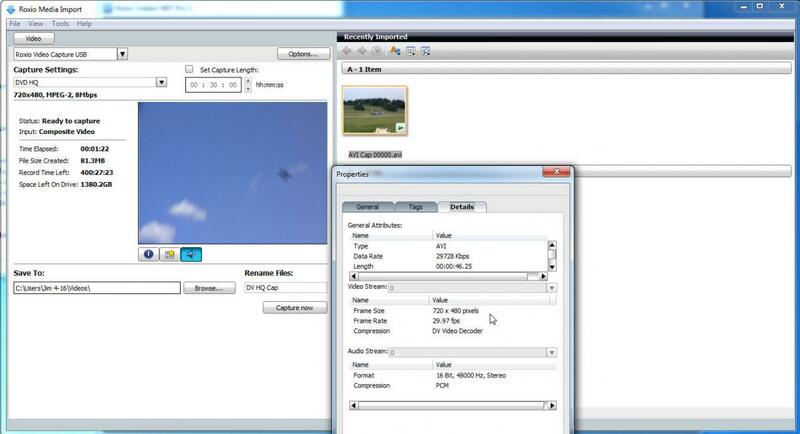 From Record, Edit, and Save Option, when I export, at best quality, the captured video to my COMPUTER folder, the software gives me a resolution choice of 640 x 480 OR 720 x 480. 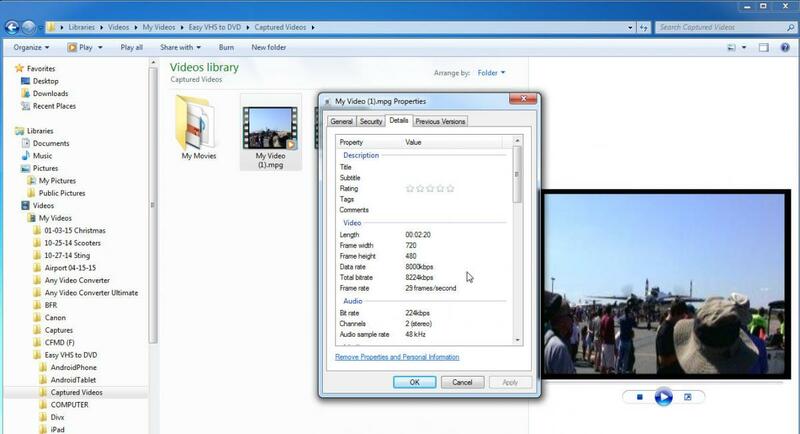 The same exported video at 640 x 480 has a much larger file size that when it is exported at resolution 720 x 480 to my COMPUTER folder. Both files (640 X 480) and (720 X 480) exported to my COMPUTER folder, have all other parameters equal (i.e. both have the data rate = 15000 and export with best quality setting). Does that mean that the 640x480res file is higher quality when I use the COMPUTER file for future edits? If not, why the larger size? Likewise, the Resolution numbers are selectable through the Drop Box and are dependent on the type of file you intend to export to. One tip - check the Properties/Details of your captured file. You do not want to exceed these as it can actually degrade quality when you attempt to render up... But EVD does capture in HQ so that is where it should stay. Additional testing in Roxio VHS to DVD 3 Plus (Build 301B91B ENU), in my attempt to capture a Hi8mm Digital Tape using an S-Video connecter. It captures the video at bit rate 224kpbs into my Captured Videos folder. I did not see an option to adjust quality on capture - so does it automatically capture this AS the BEST quality - no choice? Since the resolution for the source is 560x480, it makes sense to me to Export the captured video, using "Record, Edit, and Save Option", at the lower Resolution option of 640x480. I want the best quality so I moved the Quality bar to "Best Quality" - the higher I move the quality bar to the "Best Quality" the more the export file bit rate is increased. 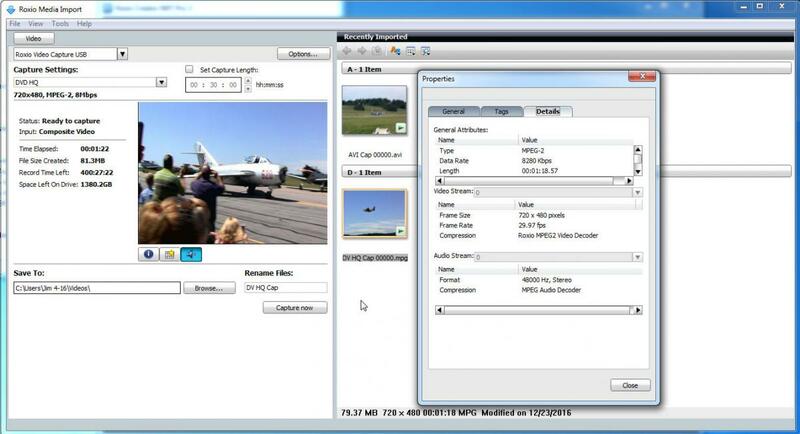 Using 640x480 at "best quality", it exports the video to my COMPUTER folder with bit rate 1536kpbs (much higher compared to captured video bit rate of 224kpbs) - WHY IS THE CAPTURED bit rate so much lower - is the capture function not capturing the video at "best quality"? Thanks in advance for any insight on what is happening. 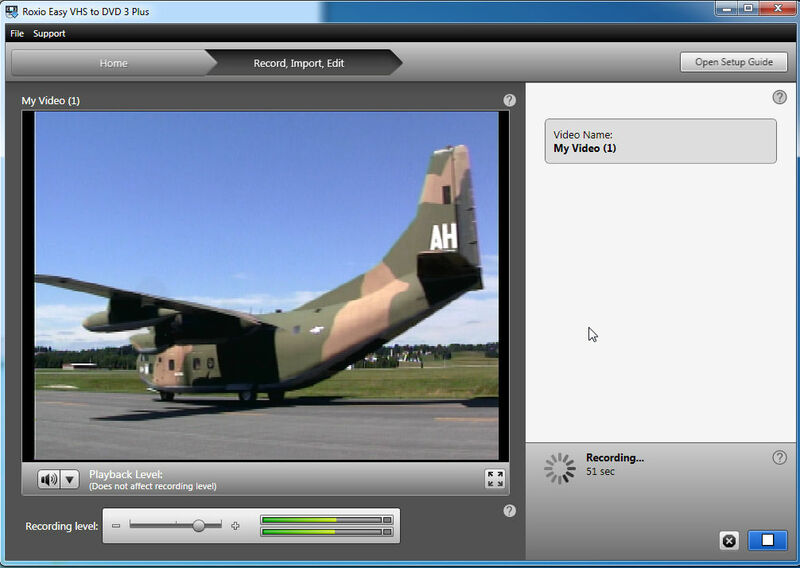 FYI from previous post: the exported video is set to MPEG2 format. I really am at a loss to understand this! 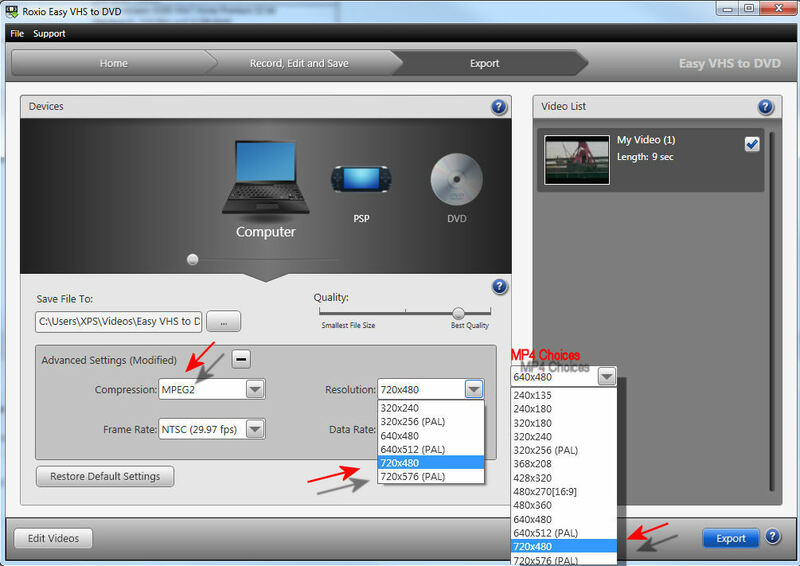 EVD captures at 720 X 480 8000 kbps no matter what!!! The 224 kbps you mentioned above is only the Audio rate, also automatic You will see it added to the 8000 as the 'Total bitrate' in Properties. The 560 X 480 is the normal resolution for Hi8, Super VHS as well as Laser Disc. Your Captured files are 720 X 480 @ 8000 using EVD. What your original source was is moot once captured. If your desired output is mpeg or DVD, make them at best quality and you are done. If you want to test at a lower quality by all means give it at try. But note that not all people are as sensitive to quality as others. The poster is capturing from digital tape not VHS. Would that make any difference? If it were a digital tape, he would need and IEEE port. Apparently the tape camcorder has the necessary "out" jacks for the USB device. A firewire isn't needed IF the camcorder has a composite or S-Video playback output. Many do so that they can be hooked up to any TV directly. Not really, the USB Capture device has no way of knowing what it is hooked up to. It just converts to a Digital Signal which is captured by the software. I dragged out my HD camcorder (1920 X 1080) and did some captures from it with the USB Capture device using Composite output from the Camcorder. All of these captures did have one common flaw though. As HD is 16:9 format everyone was squeezed into 4:3 frame No fix for that in the EVD software. Thanks for all the help! Knowing that EVD captures at 720 x 480 8000 kbps, I believe I now understand how to get my Hi8 Digital and 8mm Analog tapes rendered to my Windows 10 PC at the best quality. I tested capturing 1 minute, using "Record, Edit, and Save Option", selecting MPEG2 at the "Best Quality" (shows 15000 kbps), and at the Resolution option of 640x480. I am pleased with the resulting quality. FYI, I see the 1 minute captured file has size 67,930 KB and the MPEG2 rendered COMPUTER file size is 133,933 KB. Don't get humg up on file sizes... Roxio uses Constant Rate rendering.